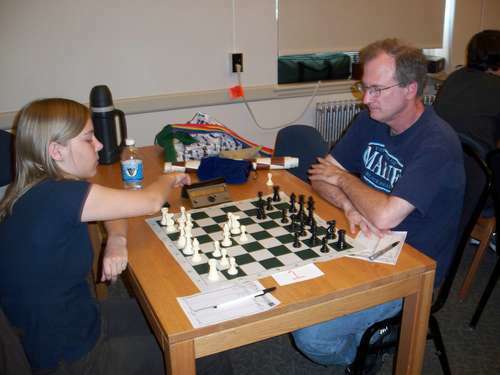 10.01.07 Maine Chess Association president Phil Lowell knotched his second tournament victory of the year (his first being at the ChessMaine.net Championship) with a perfect score of 4.0 at the Eastern Maine Open played on Saturday, September 29, 2007 at the University of Maine, Orono. Lowell was followed by Ruben Babayan with 3.5 and Lucan McCain and Fritz Eyerer each with 3.0. Here's the big illustrated report with USCF crosstables. Thanks to Tom Sandford for organizing and directing the Eastern Maine Open and for contribiting to this report. 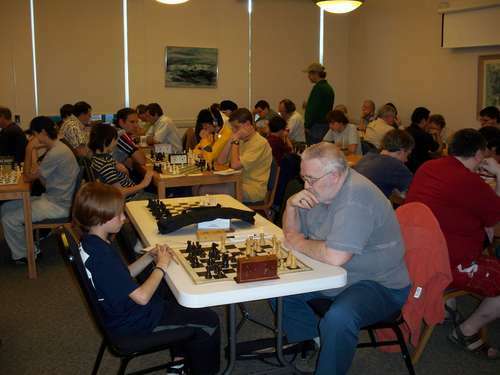 This year's Eastern Maine Open featured the strength of the scholastic players, especially from the hotbed areas around Cape Elizabeth and Bangor who played in all sections and in all classes except for the expert class. This year's attendance at sixty-three was more than double previous attendances for recent Eastern Maine Opens. As a result of the increased participants, additional prizes were awarded beyond those advertised. Upset prizes and second places were added to the Open, U1400, and U1000 sections. Additionally, all U600 entrants were awarded a University of Maine frisbee. Congratulations to the participants for outstanding games! 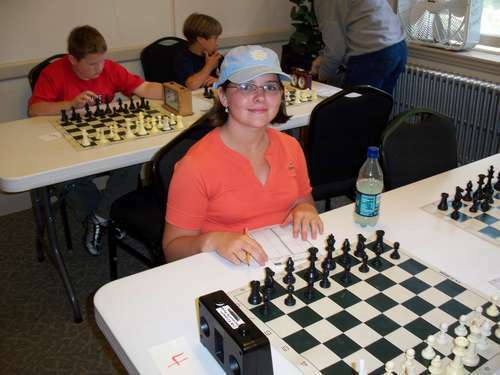 Players are asked to please forward some of their outstanding games to info@ChessMaine.net for posting on the ChessMaine games page. The winner of the Open was Philip Lowell, Jr. with a perfect score of 4.0/4. Second place was Ruben Babayan with a score of 3.5/4. The upset prize was won by Michael Dudley (1329) for his win over Daniel DeLuca (1572). The winner of the under 1400 was Aaron Spencer with a perfect score of 4.0/4. Second place was a tie among five players: Matthew Fishbein, John Ellison, Nicholas Parsons, Gianluca Pane and Zachary Smith all with a score of 3.0/4. The upset prize went to Peter Campbell (960) for his win over Paul Ciarrocchi (1338). The co-winners of the U1000 were Haley DeLuca Lowell and Wesley Parker with scores of 3.0/4. They shared first and second prize money but the trophy went to Haley DeLuca Lowell on tiebreaks. The upset prize was won by Reid Horton (651) for his win over Shannon Daly (813). The winner of this section was Brian Roderick with an unbeaten and untied score of 4.0/4. * took 2nd place by tiebreak with a score of 3.0/4 over Jack Demeter who took 3rd place with a score of 3.0/4. D (1200-1399) Matthew Fishbein (on tiebreak) 3.0/4 (John Ellison and Nicholas Parsons also had 3.0/4). E (1000-1199) Gianluca Pane and Zachary Smith 3.0/4. ...then get down to business with an Open Sicilian. Lowell won this game to win the tournament with four points in as many rounds. Ruben Babayan (front right) who took second with 3.5 points plays friend and coworker Derrick Crocker in round two. Curt Brock faces Germaine Kickert in the background. 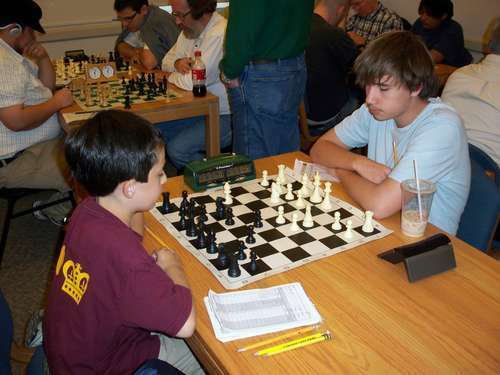 Under 1400 section winner Aaron Spencer (right) plays Matthew Fishbein in the final round. 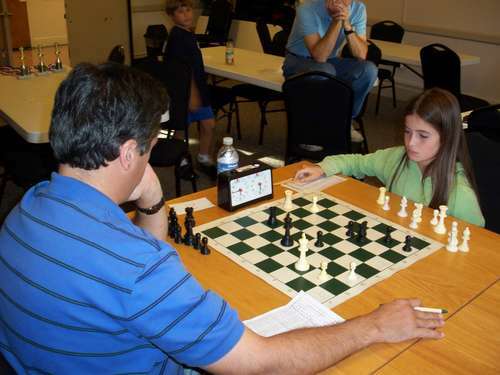 Co-winner of the U1000 section Haley Deluca Lowell plays Mark Parker for the championship. 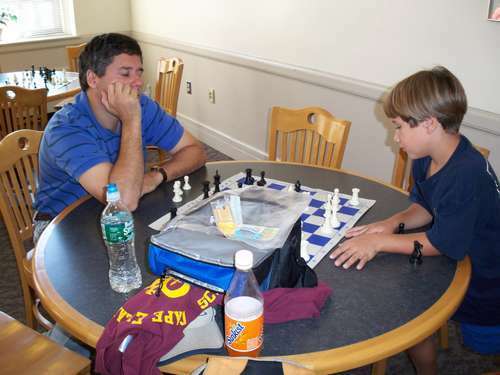 The other co-winner in the U1000 section Wesley Parker playing (Dad) Mark Parker in the skittles room. 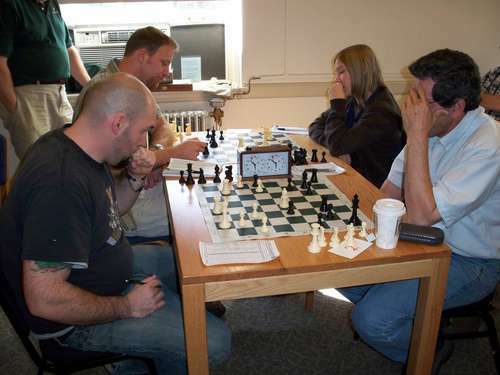 Under 600 section winner Brian Roderick (background right) makes a move vs. * while Max DeLuca Lowell (foreground left) and Colin Smith prepare for their second round game. 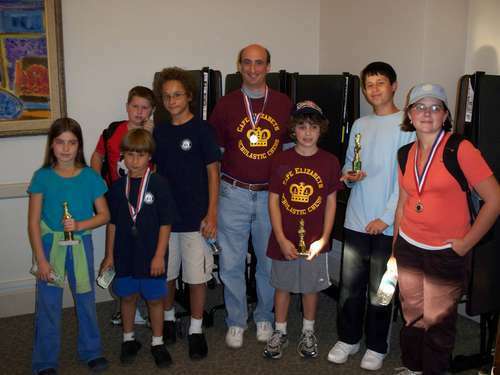 Winners in the U1000 section (left to right) Haley DeLuca Lowell, Jason Hoffpauir (background), Wesley Parker, Brett Parker, Dan Fishbein, Matthew Reale-Hatem, Robert Freccero and Shannon Daly. Winners in the U600 section (left to right) *, Jack Demeter and Brian Roderick. One of the many players to make the trip to Orono from Cape Elizabeth and veteran of two Maine Championship for Girls tournaments Shannon Daly. 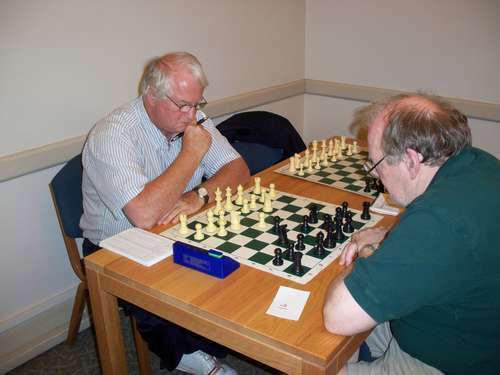 Charles Rotmil (left) takes on John Jones in round four. 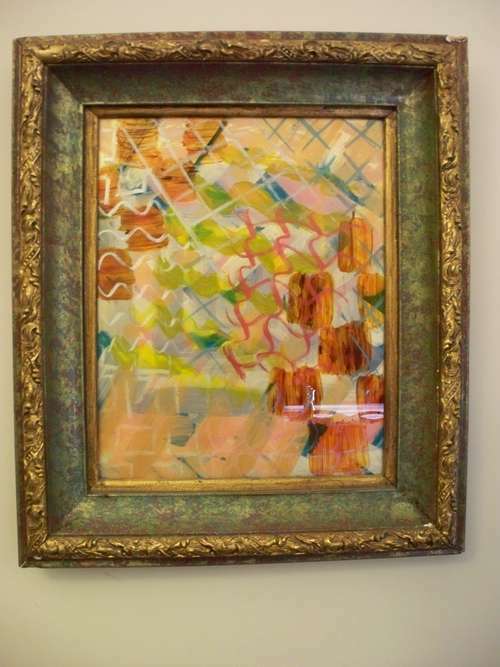 This artwork hanging in one of the tournament rooms beckoned us with a surreal chess theme. 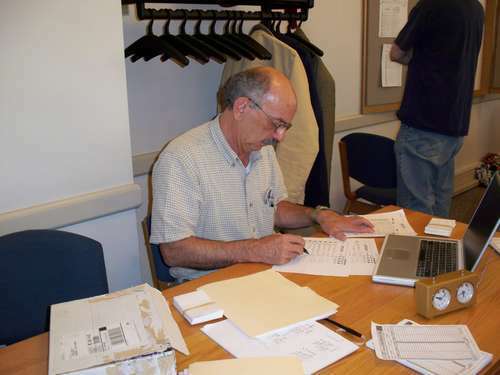 Tournament director and University of Maine Professor of Engineering Tom Sandford at the controls. 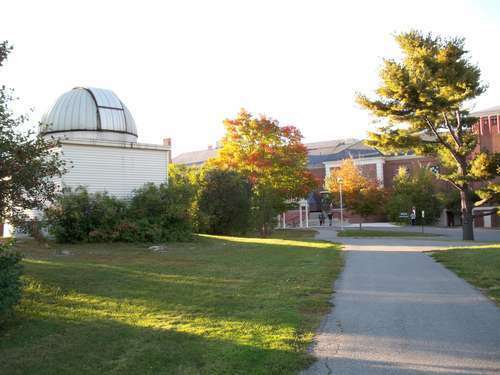 Jordan Observatory and the Memorial Union on the campus of the University of Maine, Orono. My thoughts are that there needs to be more quietness during games, I was a little annoyed at some of the noise, and one player was very rude. Hopefully this can be addressed in the future. For the most part I enjoyed myself and found most of the players friendly. Look forward to next year. Thanks for the great report. It was fun...it is not all about winning. Or is it? Dan--once again you have done a superb job of coverage. The photos are stunning. Congratulations to you, and to Haley as well.